Is it possible to intervene in another nation-state and pushback against the weight of that nation-state’s history? Can the weight of history be sufficiently balanced by intervention, allowing for the creation of enduring conditions that protect the outsider’s strategic interests? Today, the experiences in Iraq and Afghanistan, and the constraints on resources and time, probably make this an unattractive policy option. Instead, managing not resolving, the threats that pose risk to strategic interests is probably a more reasonable policy approach. This means accepting that an intervention in the affairs of another nation-state is limited to advise, assist and enable; and that the intervention will be a long-term commitment that works with the grain of history to achieve incremental progress. As a starting point for the shaping of the peace that is expected to follow the defeat of ISIS as an Army of Occupation in Iraq, the Government of Iraq has completed an Iraqi National Security Strategy (NSS). This cross-government work was led by the Office of the National Security Adviser (ONSA) with international advice and assistance provided through the United Nations Development Programme (UNDP). The Iraqi National Security Council (NSC) approved the NSS on 21 October 2015, and by the Council of Ministers (CoM) on 01 March 2016. The foundation for the NSS is the national risk register. The national core problem is set out as “the legacy of the former regime, the rapid transition from dictatorship towards democracy, and changes in the strategic environment are all characterised by violent political conflict, corruption, the outbreak of sectarian violence, terrorism and crime, and all serve collectively to weaken the social structure, which accelerates insecurity and instability.” This core problem is subdivided into tier 1, 2, and 3 risks. The tier 1 risks that must be managed in order to gradually break the historical patterns of conflict, are set out under the headings of Political, Economic, Diplomatic and Security Risks. Iraq has a history of hegemonic politics and the use of security sector suppression to quell dissent. The 2003 intervention introduced democracy at a time when the Institutions of the state were not functional. The challenge is to change the political model from hegemonic imbalance and institutional fiefdoms, and to one functioning to balance power in a manner respectful of Iraqi ethno-sectarian diversity and with democratic oversight and accountability preventing the use of the security sector for suppression. Iraq has a history of hegemonic politics and the use of security sector suppression to quell dissent. Advances along the political line of effort will be driven by upcoming elections. The evolution of the Iraqi political model will be dependent on the political leaders who emerge from the April 2018 national election. There is intense competition amongst Iraq's Shiite leaders. There are currently three main Shiite figures competing for power: head of the Islamic Supreme Council Ammar al-Hakim, head of the State of Law Coalition (Former Prime Minister) Nouri al-Maliki, and Sadrist Trend leader Muqtada al-Sadr. Each politician has his own plan to remain in power and remove the others or limit their influence. It is unknown if the current Iraqi Prime Minister Haider al-Abadi will be a contender for the future Prime Minister. A new feature in 2018 will be the presence and influence of Shiite-Muslim volunteer military forces (of the PMF) and (a small number of) Sunni-Muslim volunteer forces; some which are deemed credible by local peoples and tribal leadership relative to the political parties (judged responsible for creating the conditions that led to the rise of Da’esh). This swirl of Iraqi politics attracts the interest of every embassy. External influence is balanced between the competing views of the USA and Iran. It is probably the Special Representative of the Secretary-General (SRSG) for the United Nations Assistance Mission in Iraq (UNAMI) who is seen by the Iraqis’ as having the greatest neutrality and access, and possibly should have the lead in coordinating the partner advice and assistance to a future political line of effort. Iraq is a rentier economy critically reliant on state-owned oil-based national income. The fragility was exposed by the global oil glut of 2015. There are also serious weaknesses in the critical national infrastructure and human capital. The Iraqi NSS identifies the challenge of how to diversify from state-owned oil-based income generation and to a greater private sector, which includes revitalised agriculture, education and critical infrastructures. There would appear to be the basis for partnering support to Iraq for the design and implementation of the Economic line of effort. Both the International Monetary Fund (IMF) and World Bank (WB) have provided financial assistance to Iraq with conditions, and these conditions suggest the need for long-range structural reform advice and assistance., There is a need for assisting the Iraqi Ministry of Planning and Ministry of Finance for the development of an Economic Vision, perhaps something like the Saudi Vision 2030 which is designed to provide the basis for the Saudi Economic Plan to diversify from Oil to an improved private sector generating meaningful employment for their youth demographic bulge. This could potentially be a Consultancy Business working with Iraqis’. The IMF and WB could then continue to focus with Iraq on the realities of affordability today. Others are needed to advise and assist on the technical matters to do with the critical infrastructure and services ministries (electricity, water and sewerage, medical, transportation, etc.). The Iraqi NSS identifies the risk from foreign interference in internal affairs and notes the cause being that political blocs, some under the guise of different sectarian ideologies, having sought alignments with neighboring states. They recognise that this has both entrenched disunities in Iraqi foreign policy decision-making and secondly, provided the opportunity for neighbouring states to sponsor proxies in Iraq affording these proxies a degree of independence from participating constructively in politics. The Diplomatic line of effort is perhaps the most complex part of this problem set and manifests itself in is the Grand Strategic “Great Game” to be played out between Syria (Assad)-Iran-Russia, Iraq’s regional neighbors, and the US-led coalition opposed to ISIS. Within Iraq there is the linkage of this Great Game to the competition between the political parties and blocs, and parts of the Security Sector. The NSS recognises the need for Iraq to maintain a portfolio of foreign (and associated commercial) relationships for economic and security reasons; the challenge is how to construct such a portfolio that both protects strategic interests and mitigate malign interferences. Perhaps the first step is the previously mentioned “National Dialogue,” after which UNAMI sponsorship of a standing Regional Contact Group (with the Iraqi Ministry of Foreign Affairs) may be a second step. The Iraqi NSS identifies the principal challenge is with protecting the people from terrorism, not protecting the nation-state from foreign invasion. In June 2014, the Iraqi Security Sector was unable to protect the people of Mosul from the relatively fewer foreign ISIS extremists. This failure exposed the consequences of appointing government officials on the basis of ideological loyalty rather than professional merit, and the results of unaddressed corruption and mismanagement. Moreover, it exposed the evident loss of public trust, respect and confidence in the Iraqi Security Sector. The challenge is not how to defeat ISIS as an army of occupation in Iraq and Syria, but rather how to provide an enduring security and safety environment within which the Iraqi Sunni population are no longer vulnerable to the siren call of the extremist for the violent rejection of the Iraqi Nation State. There has been positive progress for the design and implementation of the Security line of effort. 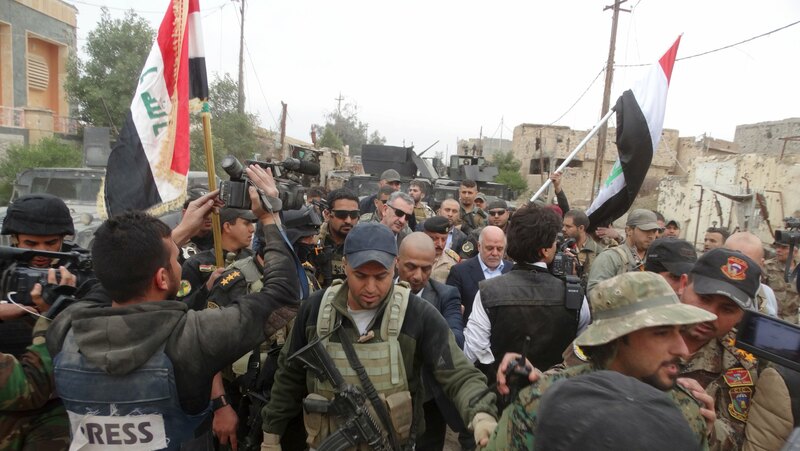 Immediate needs are being meet through the CJTF-OIR enabling the Iraqi Security Force (ISF) in the fight today. The longer-term need for the transition into Security Sector Reform (SSR) is recognised by the Iraqis. The Iraqi National Security Council (NSC) plans to consider an SSR Strategy in the spring and an organisational approach has been proposed for governing the implementation of SSR at the Deputy Ministerial level in a Joint Committee with Senior Partners (from the CJTF, NATO, EU, UN and embassies of USA and GBR). Iran and Russia, and regional neighbours, will also have a view on the future of the Iraqi Security Sector but they are not currently integrated into this thinking. The Iraqi NSS identifies corruption, and extremism and secular polarization, as two crosscutting challenges for the management and resolution of the Economic, Diplomatic and Security Risks. The NSS recognises that financial and administrative corruption and mismanagement has significantly weakened the social fabric of Iraq, made Iraq an unattractive place for business, and represents “vested interests” opposing reforms. The source of this corruption at the national level is considered to be the muhasasah or Quota system introduced by the Coalition Provisional Authority (CPA) in 2003; this has become the foundation of the Iraq political system allowing political parties to gain controlling interests in ministries hence corrupt access to national wealth for personal, patronage and clientelism reasons. The challenge is not so much about the introduction of Anti/Counter Corruption measures but rather, how to develop a political culture in which senior leaders and officials make decisions in the national interest (not party political interest), and are held accountable by both the people and an impartial judiciary. The NSS identifies that Iraqis’ have a weak sense of national identity. The history of violence and suppression has encouraged the people to fall back in on tribal and sectarian identities, thus making them more vulnerable to extreme attitudes towards religious, ethnic and cultural differences. In the aftermath of the liberation of Ninewah and with national elections approaching in April 2018, the challenge is one of a National Dialogue. PM Haider al-Abadi communicates with senior visitors on the need for this national dialogue and clarity on the type of nation state that Iraqis wish to live in - centralised, federal, semi-autonomous regions? This should set the basis for social and political reconciliation, and for a regional neighbours contact group. Enabling Iraq with a National Dialogue that is free of malign interference and aligned with the provincial and national election timelines – defining the type of nation state that the Iraqi people wishes to be. Building the institutional capacity of those Iraqi ministries that are linked through the Iraqi national security architecture to ensure that the security sector is under democratic control (and can’t be misused in political suppression). As force is gradually removed as an instrument of political process, assisting with the transition from the hegemonic principle of politics with its associated reciprocal altruism (corruption), and towards balance-of-power politics under technocratic leadership. And to use firstly, support for Iraqi economic diversification and financial management as the means to cajole behaviour that is in the national interest rather than political party interest. Secondly, establish a diplomatic regional contact group for balancing competing interests. For the IC, the author suggests that the greatest challenge ahead will be in organising an enduring and coherent advice and assistance partnership. The current weight of effort of the IC is on the security line of effort in partnership through the CJTF-OIR, and through Iran working with the Al-Hashd Al-Sha'abi (Popular Mobilization Force PMF). This is largely technical and tactical enabling on the security line of effort. Shaping the peace and protecting strategic interests in the future requires more strategic and institutional level enabling on the political, economic and diplomatic lines of effort, and with the emphasis on cultural evolution of organisations and leaders rather than technical and programmatic. While there are separate embassies and multilateral organizations, there is no standing, Baghdad-based, equivalent “expeditionary diplomatic task force” to the CJTF for bringing coherence to the multiple programmes. In this regard, it is worth noting in the lesson identified in the by 2015 SIGAR report which outlines the failure of the IC in organising itself for the achievement of Afghan reconstruction - the IC may be at following the same pathway to failure in Iraq. It is probably unreasonable to expect multilateral organizations to establish such an expeditionary diplomatic task force, hence the earlier suggestion to enable an Iraqi-led process/platform that encourages multilateral engagement in an efficient and effective manner. Iranian interests do not align with the interests of many other members in the international community. It is assumed that the majority of international community strategic interests will be protected by shaping a peace (Gray’s (2007) Maxim 3) within which Iraq is able to contain and manage its own problems, and to solve them over time, sufficiently for breaking the historical pattern of internal conflict. The international community would not want to see again (a) another recourse to another large-scale foreign intervention against a resurgent ISIS or AQ, or (b) Iraq descending into a Great Game of competing malign interferences and proxy warfare. The Iraqi National Security Strategy has identified the key threats posing risk and these conform to strategic lines of risk management effort: Political-Economic-Diplomatic-Security. As the current battle for Mosul reaches a conclusion, there is the opportunity for the IC to work with the grain of Iraq in advising and assisting in the implementation of the NSS. At strategic-level, the IC challenge is one of institutional organization and process: how best to organize what the IC collectively have already in Iraq in order to bring a parallel coherence to Iraqi efforts in implementing their NSS along their four lines of effort. Perhaps this is an area where NATO could complement UNAMI and drawing in regional neighbours in a constructive manner, leaving the CJTF-OIR to enabling on the immediate and transitional security? At the grand strategic level the challenge is likely to be in the containment of Persian-Shia-Iranian influences that excite Arab-Sunni-Regional reactions. Perhaps the only way that this can be achieved is through an Iraqi assertion of sovereignty, and this in turn will require the preliminaries of a National Dialogue process and the start of a transition from hegemonic politics. Bill Dechow is formerly of the Australian Army (1984-1991) and British Royal Marines (1992-2014). He most recently worked for the United Nations Development Programme – Iraq (UNDP-I) as a consultant in the Iraqi National Security Adviser’s Office (2015-2017). The views expressed in this article are those of the author at the end of his contract with UNDP-I. The views do not reflect the official policy or position of the Australian or British Military, Departments or Government; nor of the United Nations; nor of the Government of Iraq. Credit for the work on the Iraqi National Security Strategy belongs to Hamza Shareef Hasan Al-Jubori (formerly of the NSA Office) and UNDP Consultant Robert Gordon (Maj Gen (Rtd), GBR). The term “International Community” is used herein to describe the multilateral organisations (UN, EU, NATO, US-led International Coalition opposing ISIS) and foreign diplomatic presence in Iraq, who collectively have a common interest in enabling Iraq in defeating ISIS and establishing post-conflict stability. Gray, C., “Fighting Talk: Forty Maxims on War, Peace, and Strategy” (London: Praeger Security International, 2007), 11-15. Republic of Iraq, National Security Council, “The National Security Strategy,” Approved by the Council of Ministers on 01 March 2016, page 2. Also addressed in Annexes 1 and 2. “Sequencing therefore matters enormously. Those countries in which democracy preceded modern states have had much greater problems achieving high-quality governance than those that inherited modern states from absolutist times.” Fukuyama, F., “Political Order and Political Decay: From the Industrial Revolution to the Globalisation of Democracy” (Profile Books, 2014), 30. Available at http://chicagotonight.wttw.com/sites/default/files/article/file-attachments/Fukuyama_Ch1_excerpt.pdf. Letter from Dr. Haider Al-Abadi, Prime Minister of the Republic of Iraq and Acting Minister of Finance to Ms. Christine Lagarde, Managing Director, International Monetary Fund; dated 20 November 2016. Covering: Iraq: Letter of Intent, Memorandum of Economic and Financial Policies, and Technical Memorandum of Understanding. Available at http://www.imf.org/external/np/loi/2016/irq/12162016.pdf, accessed on 23 Feb 17.
 International Bank for Reconstruction and Development Program Document for a Proposed Loan in the Amount of US$1,200 Million to The Republic of Iraq for an Emergency Fiscal Stabilization, Energy Sustainability, and State-Owned Enterprise Transparency Development Policy Financing, dated December 17, 2015. Paragraph 36, page 19; Paragraph 39, page 20. Available at http://documents.worldbank.org/curated/en/383411468185394560/pdf/97938-REVISED-PGD-P155962-PUBLIC-R2015-0244-2-Box394828B.pdf, accessed 23 Feb 17. The Saudi Leadership Vision 2030 can be found at http://vision2030.gov.sa/en, accessed 19 Oct 16. McKinsey Global Institute (MGI), “Saudi Arabia Beyond Oil: The Investment and Productivity Transformation,” December 2015. Available at http://www.mckinsey.com/global-themes/employment-and-growth/moving-saudi-arabias-economy-beyond-oil, accessed 19 Oct 16. Abbas, Y. and Trombly, D., “Inside the Collapse of the Iraqi Army’s 2nd Division.” War on the Rocks, 01 July 2014. Available at https://warontherocks.com/2014/07/inside-the-collapse-of-the-iraqi-armys-2nd-division/, accessed 15 May 15. This observation was also made in an Iraqi lessons learned forum at the Al Nahrain Centre for Strategic Studies, Baghdad during 2015. See for example press briefings from the meeting of Iraqi PM Haider al-Abadi and the UN Secretary General António Guterres on 30 March 2017. Available at https://www.un.org/press/en/2017/db170330.doc.html, accessed 03 May 17. Sukman, D., “The Institutional Level of War,” The Bridge, 5 May 2016. Available at http://thestrategybridge.org/the-bridge/2016/5/5/the-institutional-level-of-war, accessed 17 Jun 16. Special Inspector General Afghanistan Reconstruction and US Institute of Peace. Conference Report. Lessons from the Coalition: International Experiences from the Afghanistan Reconstruction; April 19-20 2016, Washington, DC. Executive Summary, page 1. Available at: https://www.sigar.mil/pdf/lessonslearned/SIGAR-16-59-LL.pdf, accessed 17 Nov 16. Alfoneh, A., “Iran’s Revolutionary Guards Transform into an Expeditionary Force.” Atlantic Council, MEN ASource News, Analysis, Perspectives, 04 April 2017. Available at http://www.atlanticcouncil.org/blogs/menasource/iran-s-revolutionary-guards-transform-into-an-expeditionary-force, accessed 06 Apr 17. Knights, M. and Eisenstadt, M; “Mini-Hizballahs, Revolutionary Guard Knock-offs, and the Future of Iran’s Militant Proxies in Iraq,” War On the Rocks, 09 May 2017. Available at https://warontherocks.com/2017/05/mini-hizballahs-revolutionary-guard-knock-offs-and-the-future-of-irans-militant-proxies-in-iraq/, accessed 09 May 17. See for example: Malik, H., “What role will Iran-linked militias play once IS leaves Iraq?” Al Monitor Iraqi Pulse, 20 March 2017. Available at http://www.al-monitor.com/pulse/originals/2017/03/pmu-iraq-shiite-militias-iran-syria-golan-israel.html#ixzz4dY1alFuu, accessed 04 Apr 17.